Let’s face it. 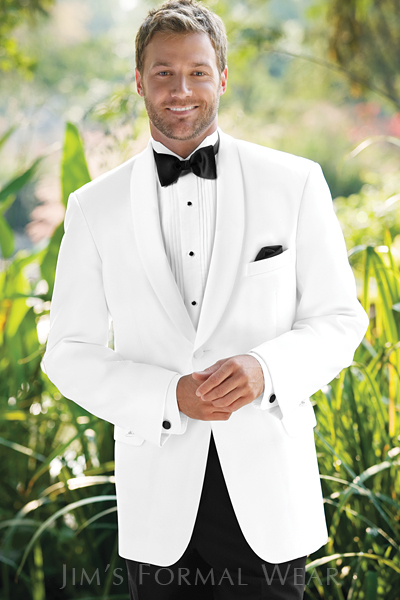 Most men may only wear a tuxedo a handful of times in their lives. So it really is no wonder that we get questions about how to wear a tuxedo on almost a daily basis. Black tie attire is fairly simple to achieve. However, there are some rules that should not be broken and some that are free to be broken, in good taste of course. This is by no means a comprehensive listing of formal wear etiquette. However, it should be sufficient to get any gentleman off to a good start. Here are some helpful tips to properly don a tuxedo at your next formal event. 1. When wearing a single-breasted tuxedo, thou shall always wear a cummerbund or vest. The primary concern is to conceal the bit of white shirt fabric that will show between your bottom coat button and your waistband. 2. Thou shall never button all the buttons on your tuxedo coat. The only exception to the rule is when wearing a one button tuxedo. 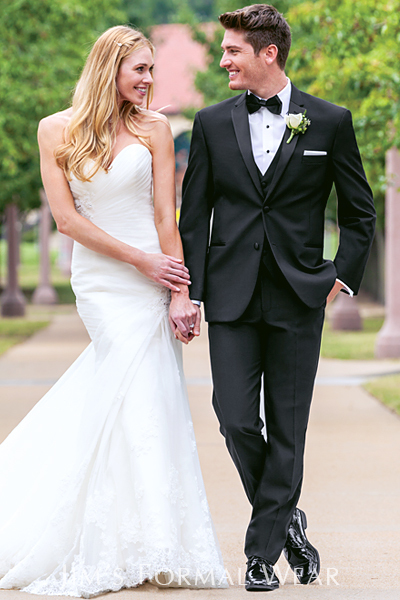 On two, three or four button tuxedo styles, the bottom button should always remain unbuttoned. 3. Thou shall not wear a belt with your formal tuxedo trousers. In fact, tuxedo pants should not have belt loops… ever. 4. Pleated front shirts are not necessary. Although they are more formal and traditional, oftentimes a man looks best in a microfiber, plain front shirt with a laydown collar. 5. When wearing a bow tie with a wing collar shirt, the wings should fall behind the bow tie. 6. 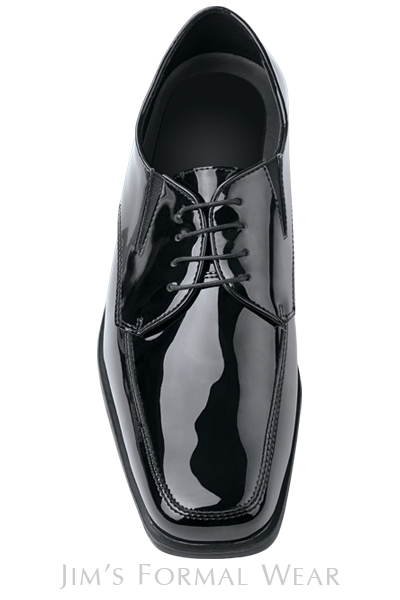 Thou shall wear formal shoes with your tuxedo ensemble – preferably a patent leather shoe style. 7. 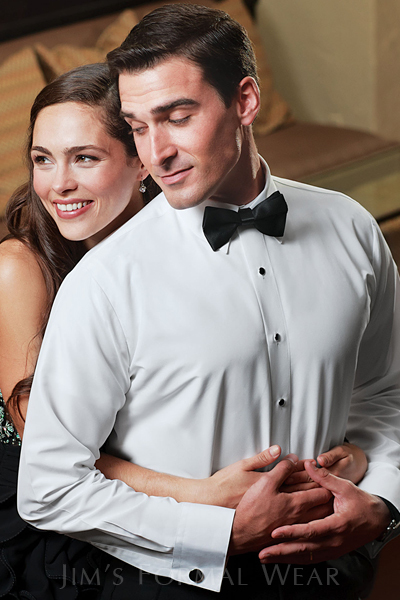 When wearing a cummerbund with your tuxedo, the pleats should face upwards. 8. 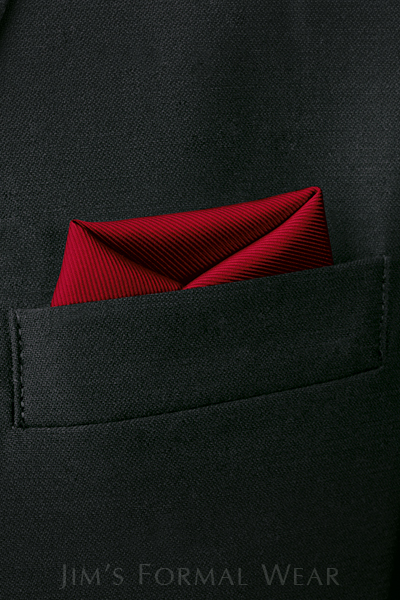 Thou shall wear a pocket square. They are a must to complete any formal ensemble. Choose a white satin pocket square with a black bow tie for a classic look, or choose a colorful tie and pocket square to liven up your look. 9. Don’t be afraid to add color to your ensemble with the use of formal accessories. Unless you’re attending a White Tie function where pique’ accessories are required, colored accessories are fair game. It’s not necessary to match, but you shall try to at least coordinate with your date’s attire. 10. Thou shall wear suspenders with a tuxedo. However, in the event that your pants stay up without suspenders, they are not necessary. 11. Thou shall not wear pants with cuffs. Traditionally, formal trousers should have a satin stripe down the side of the pant, and they should feature a straight leg hem. 12. Thou shall wear white and ivory dinner jackets only during the warmer months (Memorial Day to Labor Day) unless you are visiting or live in a warm weather climate. 13. 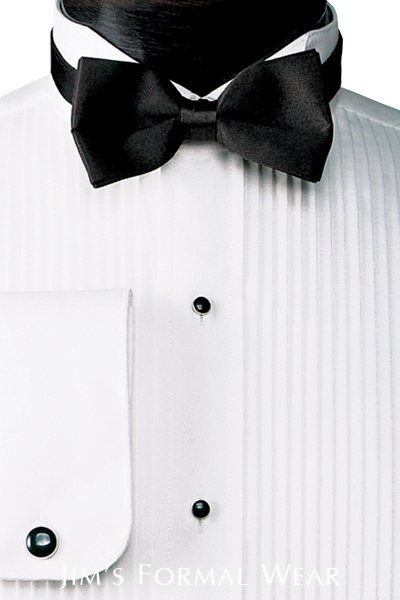 Know your dress code definitions: White Tie Invited, Black Tie Invited, Black Tie Preferred. If you think the organizers of an event meant something else, do not be embarrassed to inquire, since it would be far more embarrassing to show up in the wrong attire. 14. Smile; you’re going to look great in your tuxedo!